After much planning and sleepless nights of editing, I finally got my very first full length YouTube tutorial up! 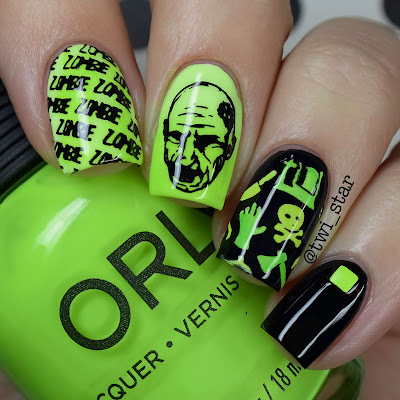 I wanted my first tutorial to represent me and the things I love so I went with a Walking Dead theme because it's my fav show, neons, and nail stamping. All things I love! I've been doing instagram tutorials for about a year and a half and for the past 6 months or so I've been debating starting an accompaning YouTube channel. I knew it would be a lot of work and the idea of putting my "voice" out there kind of terrified me, but then the annoyance at only having 15 seconds to show what I filmed kind of trumped my fear lol So I jumped in! And so far it has been very rewarding... and A LOT of work! This first tutorial probably took me about 20 hrs total to film and edit. OH. MY. That included a lot of learning on the fly though, editing a full length tutorial and doing voiceover is a completely different beast. I have since completed 2 other full length tutorials (I will post them sometime soon on my blog lol) and I've gotten faster each time. Anyways! Here is a still shot of my mani! Thank you guys for checking out my blog! I love your first video! They are a ton of work for sure, but it is so fun to see the magic happen since your nail art is nothing short of amazing! I really love the color palette you used! I don't mind the larger style pictures, but you can still see good detail in the smaller pic as well! Just don't go any smaller :) I love your nail art look! Yay for YouTube!!! Very exciting!